Looking for a colorful appetizer recipe? 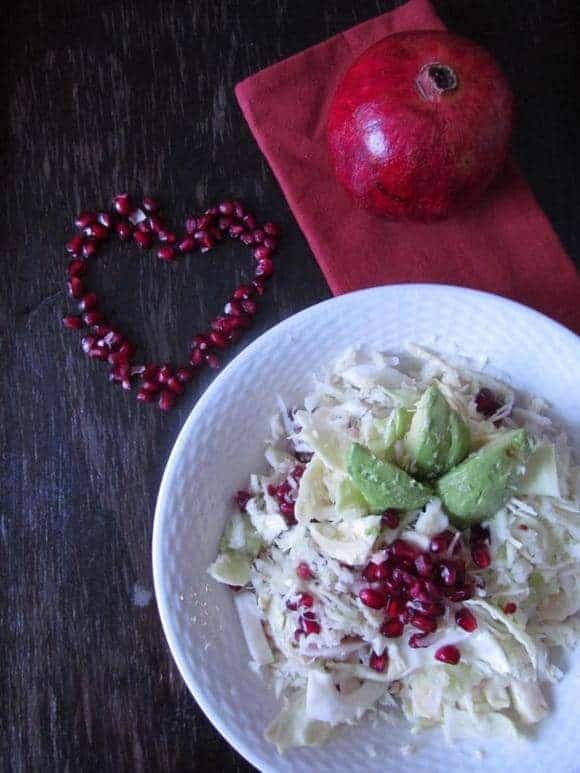 You’ll love our pomegranate guacamole! Pomegranate reminds me of my grandfather. He was the designated volunteer to dress those colorful fruits. Then my grandmother prepared a delicious salad recipe. She dressed the salad with rose water. I used to add pomegranate as a topping to my yogurt and my sister preferred eating them as a snack fresh from the fruit. But I have never tried them in an appetizer recipe until I stumbled one in those one of the supermarket booklet recipes. I was intrigued and wanted to test how it tasted in appetizer. I thought it would add a colorful spin to the holiday table. Lime zest and juice of 1 lime. Deesed the pomegranate. That is the toughest part. I learned that skill from my grandfather. I was fascinated how he deseeded the fruit. He used to cut in half. Then gave small spatula taps on the pomegranate until the seeds came out. This video shows how he did it. Check it out. Remove the avocado skins and pit. Stir in the pomegranate arils. 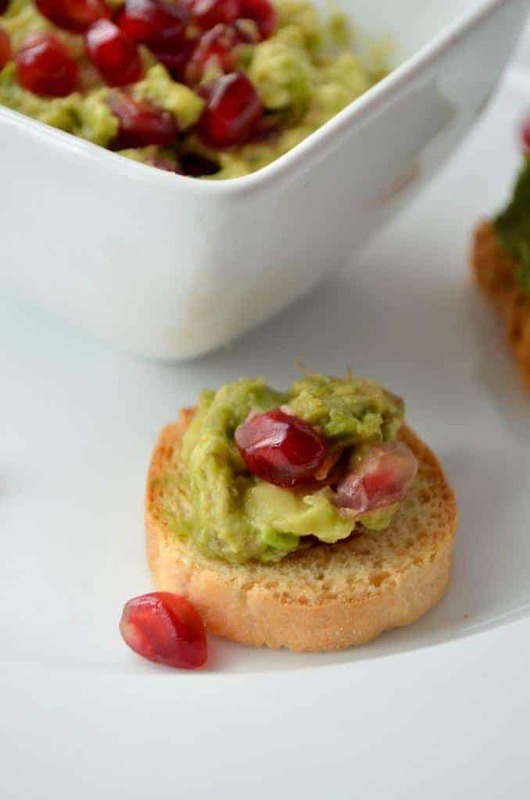 You can serve this pomegranate guacamole with pita chips, tortilla chips or mini appetizer breads like the ones I used. Desseding the pomegranate can be a messy and a pain. To save you some time and headache, make sure to desseed them ahead of time. They can be kept in a sealed container in the fridge for few days. You don’t want to dessed the pomegranate, that is fine, you can buy ready to use deseeding one. They are more expensive but they are perfect. You don’t need all the pomegranate arils for this recipe. Use the leftovers in a colorful salad. Make sure to add lime juice as soon as you mash avocados so they don’t darken. Have you ever tried pomegranate in appetizer recipes? What is your good to go appetizer recipe for Christmas or New Year’s Eve or any party? This looks really good, I need to make it. This looks so delicious as well as these are two of my favorite things to eat combined in one. Ok… I’m a Texan at heart and we are ALL about our guac. Never thought of this amazing combo! Thanks for sharing with Sunday Features!